One of the messages that has been made ever so clear to me by my mentors in the field of medicine is that every one of us today living on this planet has a total body burden of infections and toxins that is unsafe. Beyond unsafe, today's environment has created a perfect stage for numerous infections and toxins to take up residence within us and create a reality inconsistent with our desired state of health and wellness. One of my mentors, Dr. Dietrich Klinghardt, M.D., PhD explains the relationship between the toxins and the infections within us with what he describes as the "Klinghardt Axiom". The axiom states "For each equivalent of stored toxins there is an equal amount of pathogenic microorganisms in the body." Thus the importance of both treating infection and detoxifying simultaneously as part of a well-planned health optimization strategy cannot be overstated. ResultsRNA has created a program called Total Body Detox. The program consists of two powerful products that support the body in the elimination infections as well as addressing Toxic Body Burden. Advanced Cellular Silver (ACS 200 Extra Strength) and Advanced Cellular Zeolite (ACZ nano Extra Strength) are used in combination to simultaneously address our total body burden of infections and harmful toxins. I spoke recently to David Larson, CEO of ResultsRNA and Dr. Garry Gordon, MD, DO, MD (H), in order to more fully understand how these products work together to offer many health-promoting effects. Prescription antibiotics are created to address specific infections. One of the many benefits of ACS 200 Extra Strength is that it supports the body's ability to remove a wide variety of harmful organisms. ACS 200 Extra Strength is a much broader spectrum anti-microbial than traditional prescription antibiotic, antifungal, or antiviral preparations. ACS 200 Extra Strength is a 200 ppm (parts per million) colloidal silver product which helps the body address many different types of pathogens including viruses, bacteria, fungi, and other single-celled organisms such as protozoal parasites. Numerous studies conducted at a major western university have shown the powerful effects of ACS 200 Extra Strength on infections such as Methicillin-resistant Staphylococcus aureus (MRSA). ACS 200 Extra Strength has also been shown to be highly effective against Candida, a common co-factor observed in people with Lyme disease. For those with Lyme disease that may be concurrently dealing with MARCoNS, a nasal biotoxin-producing staph infection, Dr. Gordon suggests that ACS 200 Extra Strength may fully eradicate this harmful infection when used both orally and as a nasal spray. "In kill-time studies, ACS 200 Extra Strength was proven to kill MRSA in vitro in less than three minutes." Colloidal silver products available over 100 years ago had mild pathogenic kill rates as compared to ACS 200 Extra Strength, an advanced cellular silver. In kill-time studies, ACS 200 Extra Strength was proven to kill MRSA in vitro in less than three minutes. Further, the kill rate was a 7-log kill (99.99999%). Comparing a product that claims to kill 99% of pathogens with ACS 200 Extra Strength, which has been shown to have a 7-log kill, ACS 200 Extra Strength is 100,000 times more effective. A 6-log kill is generally regarded as a "complete kill" but ACS 200 Extra Strength goes beyond this to a state where essentially everything is dead in three minutes. When ACS 200 Extra Strength is ingested, the length of time that the product is present to kill infections is significantly increased. In fact, the half-life (length of time it takes for ? of the product to be removed from the body) is 15 days. Thus, the killing benefits of ACS 200 Extra Strength are ongoing in helping the body to deal with the many harmful microbes that lurk within us. Dr. Garry Gordon commented, "I am confident that, on the scale of benefit-to-risk ratio, there is nothing available at this time to compete with ACS 200 Extra Strength when attempting to lower total body burden of infection." Dr. Gordon further suggested that the director of their lab has reported that he has never seen a pathogen that ACS 200 Extra Strength did not eradicate at least 99% at room temperature in less than one minute. Dr. Gordon urges people to use the silver after brushing their teeth at night to eliminate the many harmful organisms present there - many of which are still virtually unknown. For those concerned about the possibility of "blue man syndrome" or argyria, David Larson points out that in the pre-antibiotic era, over 5 million prescriptions were issued for colloidal silver in the United States. There was not a single case of argyria reported. The only reported cases come from different types of silver utilizing unsafe manufacturing processes. Recent reports of argyria reported on "The Today Show" were based on a silver product that was made at home in a manner similar to obtaining a silver brick and using a cheese grater and then drinking a quart every day. In oral toxicity studies in animals, exposing rats to 5000mg/kg resulted in all of the animals gaining healthy weight and no signs of toxicity were observed. Larson explains that the particle size is a significant factor in whether or not the resulting product has the potential for becoming toxic. In ACS 200 Extra Strength, many different particle sizes are utilized to attack the multiple types of infections which it helps to eliminate. When we examine our toxic body burden, it becomes readily apparent that we are all exposed to many toxins on a daily basis which are not supportive of optimal health. Babies born today have more than 200 measurable toxins which they receive from their mothers during pregnancy. From the very beginning, our immune systems are impaired by these heavy metals and other toxins. From the first day of our life on this planet, we are the perfect host for numerous health-negating pathogens. Pathogens and toxins lead to inflammatory conditions which further lead to degenerative diseases of all types. It is through a targeted attack on both pathogens and toxins that we once again begin to shift that balance back towards a state of health and well-being. We cannot effectively address one without also addressing the other. Dr. Gordon believes that there is a strong relationship between the infections within us and the many toxins that we accumulate during our lives. This idea is expressed in the concept of "Total Body Burden" which defines the synergistic relationship between infections and toxins. Both must be eliminated simultaneously through the use of an effective treatment protocol which maintains a focus on reducing levels of infections and eliminating stores of toxins within each of our bodies. Further, there is a relationship described between certain organisms and toxins which illustrates these concepts. As an example, to eliminate heavy metals, one must also address the specific infections which may be bound to or highly protective of these heavy metal toxins. Likewise, to eliminate infections, one must aggressively reduce toxic heavy metals. Doing so makes the overall terrain of the body less hospitable to foreign invaders as well as improves our immune response which then enables the body to heal more effectively. In my April 2008 article in this same publication entitled "Chronic Lyme Disease: Battle Requires Attack on Multiple Fronts", Dr. Gordon discussed the shocking truth about the harmful toxins that we all carry unknowingly within us. The article mentioned an October 2006 experiment with National Geographic science writer David Ewing Duncan, in which a battery of tests was run to evaluate 320 different chemicals. Of these 320 chemicals, David tested positive for 165 of the 320 chemicals evaluated. The more concerning part of this experiment is that this was a person that was identified as being "healthy and well". Imagine how many toxins exist within those of us that define ourselves as "unwell". Mercury, pesticides, dioxins, phthalates, PCBs, PBDEs, and many other substances are almost universally present in our modern day, industrialized society and therefore in us. Fortunately, products made with zeolite have a remarkable ability to help rid the body of these harmful toxins. Zeolites are naturally- occurring substances found in volcanic ash. Their crystalline structures act as negatively charged cages which attract positively charged toxins within the body and maintain this bond until the toxins are fully excreted after 5-7 hours. As the cages move through the bloodstream, toxic heavy metals, toxic chemicals, and free radicals are attracted to the negative charge much like a magnet. This ability is called "cation exchange capacity". Cation exchange is a measurement of toxin uptake potential. ACZ nano Extra Strength provides the highest available cation exchange in super-cleansed, nano-sized zeolite crystals which are infused into "wetter-water?". This allows for the highest possible detoxification potential and rapid penetration into the body. With traditional products that may be used to help remove toxic heavy metals, there is a risk that the metals may not be bound tightly enough with the detoxifier and thus can, in some cases, result in a redistribution of toxic heavy metals into areas of the body where those toxins may be more problematic, such as the brain. Once bound with ACZ nano Extra Strength, the bond cannot be broken and the toxic heavy metals are eliminated through the urine. Of the heavy metals, zeolite has the highest affinity for mercury followed by lead. Another beauty of zeolite detoxification programs is that they do not create the same level of stress on the kidneys or liver that EDTA, DMPS, or DMSA might. Additionally, with some detoxification options, there is concern over the loss of minerals which occurs. With ACZ nano Extra Strength, the product has a very low affinity for nutrient metals and also contains calcium, potassium, magnesium, and other nutrients. This eliminates any potential nutrient metal loss by replacing essential nutrients. With other metal detoxifiers, there is concern about chelating a patient that has amalgam fillings in their mouth. ACZ nano Extra Strength can be safely used by those with amalgams. In fact, ACZ nano Extra Strength is reported to be so safe that it can even be used by pregnant mothers, children, or the elderly. Another compelling aspect of ACZ nano Extra Strength is that it acts as a free radical scavenger, reducing oxidative damage within the body. Traditional antioxidant therapies work by donating an electron to the free radical. Zeolites work differently in removing free radicals in that they are captured in the zeolite cage itself. When we are toxic with heavy metals, as almost everyone today is, our free radical load is significantly increased. Having a mechanism to reduce both the level of heavy metals and scavenge free radicals serves as a powerful tool in our health-promoting arsenal. "Beyond the ability of ACZ nano Extra Strength to remove toxins from the body, it boosts the immune system, enhances the body's metabolic function and nutrient absorption, alkalizes the body, and improves the body's ability to resist disease." Beyond the ability of ACZ nano Extra Strength to remove toxins from the body, it boosts the immune system, enhances the body's metabolic function and nutrient absorption, alkalizes the body, and improves the body's ability to resist disease. In addition to the antiviral benefits provided by ACS 200 Extra Strength, ACZ nano Extra Strength itself has been shown to have antiviral effects against entero-viruses and herpes simplex. Combine the antiviral properties of zeolite with the known fact that immune function improves as toxic load decreases and it becomes quickly evident that ACZ nano Extra Strength provides multiple health benefits. Further, there are even some studies that show that zeolite may have anti-cancer properties by eliminating carcinogens from the body. Studies have found that zeolite has tumor suppressing properties as well. 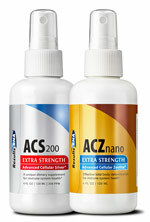 ACZ nano Extra Strength has been shown to support healthy digestion and nutrient absorption. Even more interesting is the growing evidence that suggests that zeolite is an immune modulator and can increase specific groups of T cells. All of these properties point to an increased overall state of health. Zeolite powders have been used for at least a thousand years in numerous applications. Zeolite powder was given the residents of Chernobyl to reduce radiation levels. It was also used in the Ukraine and Belarus to bind radioactive materials. They have been used to purify the air in the space shuttle. Zeolites are further known to improve digestive health and promote weight gain in animals in Europe and other countries where hormones and antibiotics are no longer allowed. If J.J. Evans from "Good Times" were here today, he likely would have replaced his catch phrase "Dy-no-mite" with a more modern "Ze-o-lite". Linda Heming, a satisfied user of both products, told me, "I use ACS 200 Extra Strength along with the ACZ nano Extra Strength in my life-long detoxification program. I like to treat and prevent while eliminating heavy metals from my body. The daily assault we experience from environmental toxins makes taking these two products even more important in my daily regimen to successfully address many different health problems. I carry a bottle of each in my purse everywhere I go." The therapeutic dose of both products is 10 sprays 4 times a day. Total Body Detox will support the body in both lowering total body burden of infections and toxins simultaneously. Dr. Gordon suggests that a powerful reduction in total body burden often occurs after one month of treatment. This reduction in body burden allows a shift towards wellness that cannot be attained without a solid focus on lowering one's total body burden. Here's to your health?